Morgan Le Fay was said to have been a powerful sorceress in Mediaeval Arthurian mythology. Imagine her gliding around her dark, imposing stone castle with its tall spiralling pillars and flashes of richly coloured wall tapestries. This is what inspired me to make the Morgan Le Fay necklace which is composed of a beaded crystal pendant encapsulating a central Rivoli, suspended by a delicate crystal bail from a twisting beaded rope. 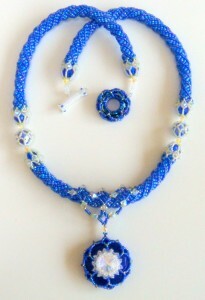 The rope is broken on each side of the pendant by a beaded crystal bead flanked by detailed beaded bead caps; the toggle closure is made up of a smaller Cosmic Ring and a beaded, embellished toggle bar. 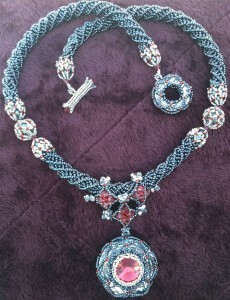 The necklace is fabulous to wear and draws a great deal of attention, it’s also very exciting and challenging to make. I loved how the strong gunmetal, Comet Argent and Padparadscha colours produced the desired mediaeval effect. I taught Morgan Le Fay at the 2012 Bead & Button Show (my first experience of the B&B – very exciting) and am very much looking forward to teaching it at Daventry at the Great British Bead Show in June, 2013. This Cobalt Blue and Citrine necklace is a second version of Morgan Le Fay using one of the Crystal Medallions I made last summer.